Have you been planning of going to the Caribbean? Is this the reason why you’re at this CaribbeanCupid review? Well then, continue reading the information provided for you below. Caribbean women are one of the gorgeous women on the planet. This may be the reason why western men are dreaming of dating them. Some are even traveling to the Caribbean just to meet one, but did you know that the possibility of encountering one is actually not that high? This is why dating sites are here to make sure that you will be attending a Caribbean woman once you get to the island. 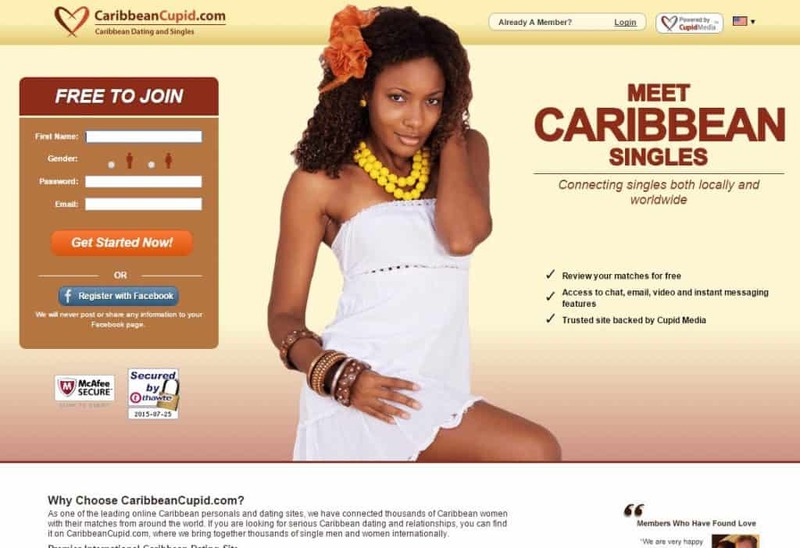 In this CaribbeanCupid review, we will talk about if this is worth signing up for or not. In this way, we will know if your chances of meeting a gorgeous Caribbean woman is possible. CaribbeanCupid is for people who are looking for a Caribbean love. With their thousands of registered members, it is definitely one of the premier international Caribbean dating sites today. It is associated with Cupid Media network, which is known to be one of the best when it comes to dating sites. This also means that people should be confident when it comes to CaribbeanCupid’s reputation and authenticity. The primary goal of CaribbeanCupid is to make sure that they will be able to assist people in meeting and eventually be together in the future. They always make sure that they will be able to provide nothing but the high-quality service that there is for its members. Majority of their members are from different parts of the world who are looking for a Caribbean woman that they can meet and be with. Just like with the other online dating sites, CaribbeanCupid also has a free trial membership. This kind of membership will allow you to explore the site and check the search options. Typically, when a member is satisfied with what he sees on the site, they subscribe to CaribbeanCupid’s platinum or gold membership. Both of these memberships are known to be a significant investment especially if you are serious about finding a woman to date. Each of the membership available at CaribbeanCupid provides different kinds of benefits. But, based on the information on the site. The platinum membership offers more value for money because of the features that it has. One of the best things about platinum is that members with free membership can talk to you once you contact them. This just means that you have the option to speak to almost everyone whenever you please. You will also get a chance to get to know them first before anyone else does. As of this writing, there are not a lot of members at CaribbeanCupid compared to its other sisters like the Afro Introduction. This just means that your dating options might be limited. But always remember that fewer opportunities don’t necessarily mean that you won’t be able to find someone that you will like and will also want you in return. Also, if you are someone who is looking for a Caribbean woman, then you don’t have to worry about anything because there are definitely a lot of Caribbean women here. If you are someone who wants to create a profile pretty quickly so you can browse through their different pages, then CaribbeanCupid is the one for you. The reason behind this is because there are only four different fields that you need to fill up before you successfully create your membership. As mentioned above, you will need to enter your first name, gender, email address, and your password. Once done, you can begin sculpting your profile to provide you with nothing but the most appealing pattern for Caribbean women on the site. But if you are going to stick with the free membership, put in mind that you will only be able to do little under this membership. Some of the things that you will be able to do are to check profiles of other members, show your interest with them, add members as your favorite, and as well as read the messages that came from paying members. So if you are serious about finding a Caribbean woman to love, then upgrading your membership right after signing up would be best. It can be annoying to be able to find someone only to find out that you won’t be able to message them properly. Don’t ever experience this kind of problem by sticking with the free membership. One of the main features of CaribbeanCupid is that they allow you to create a profile without spending a dime. This will help you to browse through the list of the members and find that person that you are looking for. In your profile, you can always include relevant information about yourself so that other members can get to know you. As a member, you will also be able to upload a few photos and chat with other paying members, for as long as they are the first one to approach you. If you are someone who doesn’t have ample time, then you should worry because it will only take you a few minutes to finish everything. It is essential to complete your profile as this will boost the number of members who will be interested with you. When it comes to their search tools, you don’t have to worry about anything because this feature is very detailed. The tool will let you filter the kind of relationship that you are looking for. As a member, you will also be able to add in a personality profile to your regular ones. This will help other members to get to know you more. If you are someone who doesn’t feel like browsing your searching, worry not because the site has the ability to give you automatic matches. They will also highlight some of the members that you might like. Now, when it comes to email other members, you can definitely do that because CaribbeanCupid has this kind of feature as well. You have the ability to send in private email messages to other members. Also, you can send “interests” to other members that you want to get to know. This will help them know that you’re interested in them. The sending of “interests” will save you ample time if you don’t have the time to send personal members to each and every member that you please. Another useful feature that CaribbeanCupid has is the instant messaging one. This will allow you to send in chats real-time using the text. If you prefer talking to a member instead of typing, there are different video options to choose from. You can always record a video, which you can post on your profile. You can also send in private video mails to make it more exciting and personal. If you are planning to take things into the next level, then this is a useful feature as the person that you are chatting with will hear your chive and see your facial expression and body language. WOW! The Caribbean women on here are so beautiful. They have curves in all the right places. Too bad most of them are from the Caribbean’s, and I rarely visit there. This is the first time I want to move to a place specifically for the women. Aside from that, the web chatting is excellent, and I use it a lot since it’s hard to meet up with these ladies. Well, once I signed up and did all the necessary stuff like filling out the profile, I began looking through the many profiles of the women here. And to my enjoyment, there are tons of beautiful Caribbean women here. When I would visit the Caribbean, I would meet up with these ladies and enjoy each others company. I visit the Caribbean so much these days that I might just move out here permanently. These are all of the information that you need to know about CaribbeanCupid. With this CaribbeanCupid review, you have surely got to read everything that there is to know about this online dating site. As mentioned above, the site doesn’t have a lot of members, but if you are looking for a Caribbean woman, then this is the online dating site that you will surely love. Start hitting that sign up button so you can begin your search for that perfect Caribbean match.